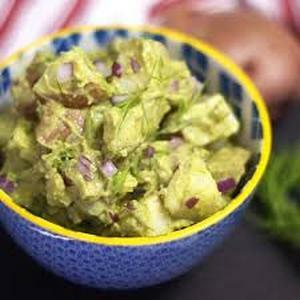 While the potatoes are cooking, combine the avocado, Dijon mustard, red onion, cucumber, dill, lemon juice and salt in a medium bowl, and mash well with a fork. This mixture will be on the acidic-tasting side, until you mix it with the potatoes, but feel free to adjust any flavors to suit your taste. Allow the steamed potatoes to cool for at least 20 minutes (preferably in the fridge to speed things up), then gradually add the cooled potatoes to the creamy avocado sauce, mixing gently to coat well. Depending on your potato salad preference, you may or may not want to use all of the potatoes--> it just depends on the ratio of sauce-to-potatoes that you like! Add the potatoes gradually so you can assess the creaminess as you go. Marinate in the fridge for at least an hour, so the potato salad can completely cool and the flavors can meld. Serve chilled, and store the leftovers in the fridge for up to 3 days.